Help Create a Disability Friendly Kitchen for our Volunteers! We are fundraising to transform our kitchen into a disability-friendly training space. If you would like to help please click here to make a donation. Pause Cat Cafe’s mission is kindness, and it’s not just kindness to our twelve rescue cats, we also run projects to help the local community. A big part of this is our work providing training for people with disabilities. Since we opened in February 2017, Pause has been helping people develop their skills through volunteer placements in the cafe – disabled people have been learning tasks like serving customers, wrapping cutlery and preparing the tables. Our volunteers, who have conditions ranging from autism and Asperger’s to sight loss and physical disabilities, gain confidence and improve their people skills as well as learning tasks that can help them to be more employable. We work with a number of local charities and training providers including SWRAC. Adrian Gunner, Principal at SWRAC, said that he values our greatly. “They have a serious business approach combined with an absolutely ethical approach to all they do. 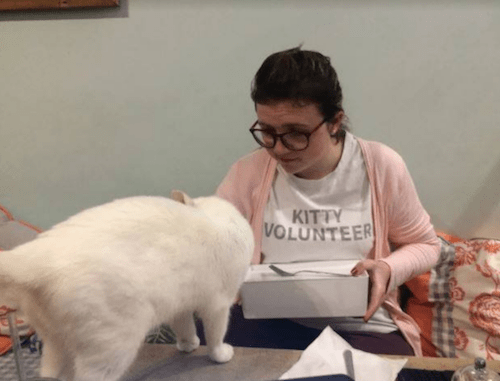 The offer of work experience for the disadvantaged cannot be underestimated, it is a great way to build up people’s confidence, esteem and social & employability skills – all essential to help people get into work.” Being an animal lover himself, he finds the cats theme absolutely inspirational and unusual. We have helped SWRAC considerably in their work with those with special educational needs. Our volunteers get a lot of enjoyment from working in the cafe. Ellie, who recently found love on Channel Four’s ‘The Undateables’, volunteers at the cafe twice a week, Ellie says “I enjoy working in the cat cafe, I like playing with the cats and I like telling my friends that I work in the cafe”. Providing opportunities in the kitchen will enable volunteers to gain useful life skills. Naomi is another volunteer, who loves helping out in the cafe but is keen to expand her skills and help in the kitchen preparing food. Currently, it’s not set up to accommodate people with special needs, and is too small to comfortably fit a chef, a volunteer and a support worker at the same time. We intend to extend the kitchen and make it disability friendly by creating wheelchair access and safety-proofing certain areas to allow people of all abilities to be trained in working with food. To help make this dream a reality, we are looking for volunteer support workers to donate a few hours a week to work one-to-one with people, helping them complete their tasks. We’re also looking for an additional part-time chef with a unique mix of skills – somebody who shares the Pause mission of kindness, wants to help others realise their potential, and who loves cooking healthy, artisan vegetarian and vegan food. If you’d like to apply, please get in touch here.